Greeting from President | About us - TOKYOINSTRUMENTS,INC. Initially we began handling multichannel spectroscopic instruments that had not been popular in Japan, but since that time we have expanded our business centered around spectroscopic devices, such as lasers and photodetectors. Parallel to the import and sales of foreign products, we started in 1998 to develop our own product, the "NanoFinder series". This pioneer of confocal Raman microscopes was realized with the support of the Japan Science and Technology Agency (JST). Since 2003 when we launched this new product, we have been patronized by many customers in Japan and abroad. In that process, we grew from an import and trading company to a research and development type technology trading company with high technical capability. We could now provide technical services such as manufacturing special experiment equipment for use in cutting edge research. Recently, as a new business fields, we delivered a wide range of products and technologies such as X-ray photoelectron spectroscopy equipment, cathode luminescence microscopic systems, physical property measurement equipment, ultrasonic platforms and many others. In the recent economic environment, where research and diversification, technologies and markets are rapidly changing, Tokyo Instruments has been spreading our antennas all over the world to contribute to the research and development capabilities of Japan in order to support the development of cutting-edge equipment and technology. At the same time, we strive to make professional suggestions to contribute to customer's problem solving. This is possible through the diverse human resources of Tokyo Instruments. These excellent employees are full of positive and challenging spirit with a long history of supporting the brand of Tokyo Instruments. Besides Japanese, excellent multicultural sales and engineering personnel including Russians, Chinese, German, etc. understand and handle a wide variety of products to meet the needs of teachers, researchers and engineers engaged in advanced research and development. Each person has extensive knowledge and we are proud to act as a professional technology trading company that can handle a wide range of jobs. The customers of Tokyo Instruments are researchers and engineers who are constantly "excited" and "thrilled" with the results of experiments and new findings that no one expected. Tokyo Instruments also aims to grow by working on the creation of new business and value with "excited" and "thrilled" innovative ideas. I believe that there is a business that can make a big contribution to society only by ideas that no one yet thought, and we will do boldly without saying anything impossible. Tokyo Instruments has formed a global network in conjunction with many suppliers who provide state-of-the-art products both domestically and abroad. At Tokyo Instruments, we work closely with our suppliers, not just our customers, to continue to meet the needs of our customers. Tokyo Instruments aims to contribute to the future and development of science and technology with its own technological capabilities and creativity. Tokyo Instruments has been managing with a global perspective based on a firm in tension of the founder Mr. Shoji Suruga. After the collapse of the former Soviet Union in 1991, Mr. Suruga quickly discovered and introduced technology related to lasers and spectroscopic equipment and started business with CIS countries in 1992. In the years 1994 and 1996 Tokyo Instruments established the joint ventures Solar TII Ltd. and Lotis TII Ltd. in Belarus under the roof of the TII Group. In 2002 Symphotic TII Corp., a joint venture company in the United States of America was established and in 2010 we welcomed Unisoku Co., Ltd. as a group company, are always striving to grow TII Group's global presence. 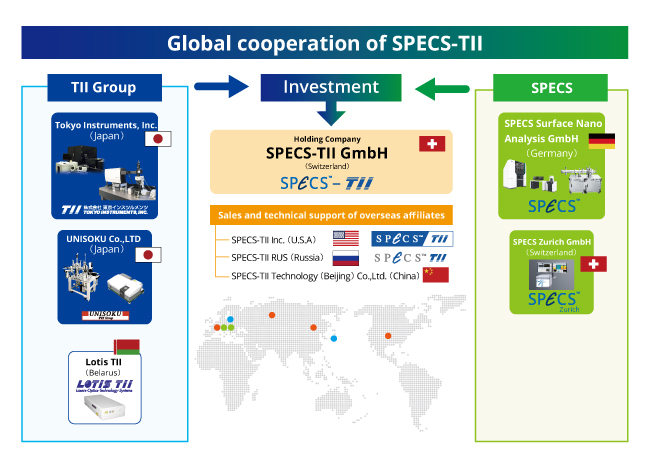 In order to rapidly expand our activities globally, in 2017 SPECS-TII GmbH (Switzerland) was established together with SPECS GmbH (Germany) as a joint holding company for simultaneously founded sales and support bases in the US, Russia and China. With the planned establishing of sales offices at each site, we strengthen the sales of SPECS products and TII group products and strengthen our technical support system. We will continue to expand and strengthen our global collaboration and respect the core competencies possessed by each company while aiming to create "new value" through strong cooperation.